I wanted to take a few minutes talking about a topic that I am very familiar with and I’m sure many of you are as well. It’s how to get clear skin. Regardless of whether you are a man or woman, we all strive to have clear skin. We use skin as an indicator of the inner wellness but also as a sure sign of appeal. Unfortunately many of us struggle with having clear skin. Unfortunately, I was not blessed with having that perfect skin. I’ve always envied women of other descent that have flawless skin without even trying. I know quite a few of these women myself. Their skin is extremely smooth and soft and without any lines or imperfections. How on Earth do they accomplish this? Sadly (for me), it’s genetic, and no matter what I try, I will never be able to reach the level of smoothness and flawlessness in skin as they do. There are, however, ways we can improve the appearance of our skin regardless of genetics. I do know there are certain diseases and ailments that may cause us to have acne and I do not have experience with that so I cannot speak on that specific topic. I did, however, want to speak about ways we can help our skin look better than it did before. This one is the most important. If you eat badly, it will show on your face. I can tell this happens to me every time I eat poorly. If I have binge days, my skin always breaks out because of it. If I eat too much sugar, my face shows it. I have also found this happens when I eat too much protein (more than 100g per day). Of course, this varies from person to person but there are general ways to make sure your nutrition is up to par that will work with getting your skin nourished. Easier said than done? Yes. I know. I struggle with the nutrition aspect myself but what’s life if there’s no challenge to move past, right? If you eat good natural food, your skin will glow and it will become clear on your face. Sleep is most certainly NOT overrated as your friends might be telling you. Sleep is extremely important as it allows your mind, your body, and your skin to regenerate and replenish. You need your 7-8 hours nightly so that you can feel fully rested and ready to take on the day without any added stress or anxiety that would be caused by lack of sleep. Also, your body heals when it sleeps. When you’re sick, you sleep and that’s how you get better. I found that my acne tends to disappear much easier when I apply treatment to it at night and go to sleep. In the morning, it usually looks so much better. Something magical happens at night and it’s fabulous for skin! Take your rest, relax your mind and body, and your skin will thank you for it! The more you relax and stay in a peaceful state, the more your skin will glow and be happy. I’d be lying if I said treating and caring for your skin is not important. It is just as important as the two previous points, and especially when you might be lacking in the previous two! I’ve always struggled with having acne, whether it was because of adolescence, hormones, food, touching my face too much, acne has always been an unwelcome visitor on my skin. Thankfully, having an Esthetician in the house (my Mom) helped! She’s the person that drilled into my head that you must NOT touch your face if you don’t want pimples. You must wash your face daily, you must take your makeup off nightly, and you must be sure to use scrubs and treatments weekly, depending on individual needs. 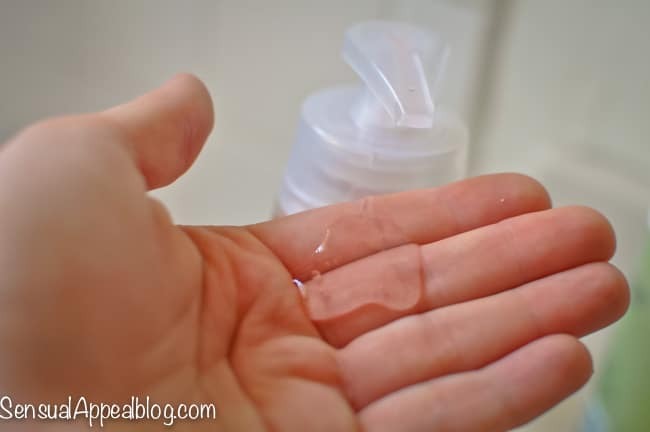 Cleanser – It’s important that you wash your face with more than just water! While some people swear by using simple bar soap, this is not good enough for some who has acne-prone skin. Having sensitive and acne-prone skin has taught me that it’s important to use the right kind of product. 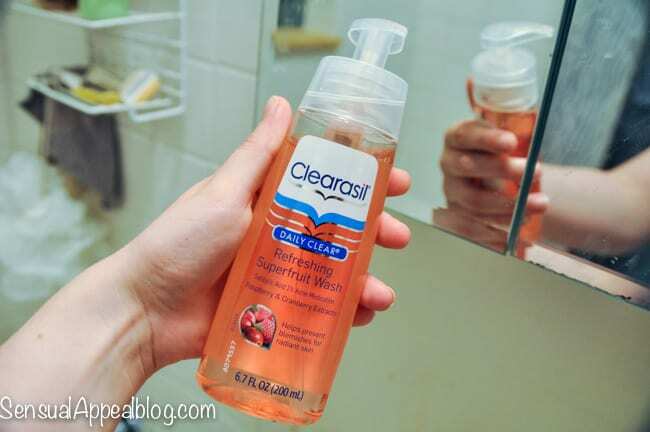 I had the opportunity to try Clearasil’s NEW! Daily Clear Refreshing Superfruit Cleansers. This particular cleanser is gentle enough for daily use, even twice a day, but it still contains 1% acne medication so that your skin is protected from future blemishes. I think this is pretty awesome because, as someone with sensitive skin, I am always worried about using an acne cleanser more than once a day. But if you have a special day coming up (or just the weekend) and you want to make sure you look your best – you’ve gotta work and treat your skin right. I have not used the product for more than a couple of days but I have enjoyed it so far and the scent is refreshing and delicious. Scrub – My Mom always scolds me for forgetting to do this step weekly. Thankfully I have been a lot better at it the last few weeks since I put the scrub in the shower and I just do it then. I never did the scrubs but they are important because they help take the dead skin cells off and you are left with a skin that’s softer and smoother. This also prevents new breakouts from forming, especially if you use acne-medicated scrub, because you will be getting rid of dead skin cell buildup on your skin. Your pores need to breathe and you can make it easier for them by using a weekly scrub! Spot treatment – Biggie and totally important for when you get acne and want to get rid of it. DO NOT pop your pimples! I have done it and I am left with post acne marks and little scars on my face from it. I always try my hardest not to pop the pimples – sometimes it’s unavoidable, they are just begging for it, but TRY TRY TRY not do it! Apply spot treatment to the pimple and just let it do its work. Within a day, two, or three the pimple will be gone and there will be no mark of it ever being there. Whew. You can find Clearasil’s NEW! 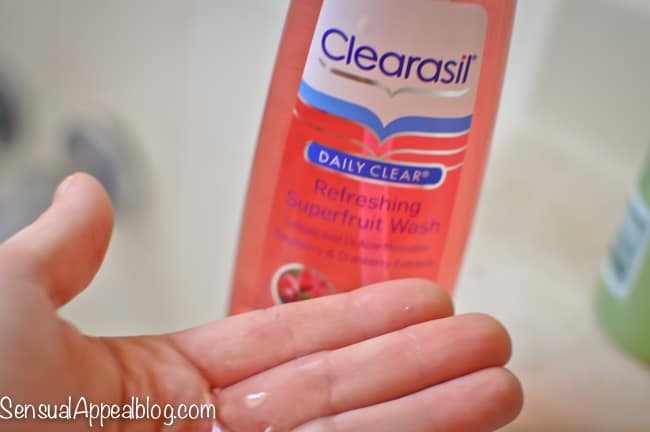 Daily Clear Refreshing Superfruit Cleansers at Walmart. Grab your coupon here and try it out for yourself. What is YOUR secret to getting clear skin? SO true about all these facts. I suffered from awful skin when I first started recovering from my eating disorder and I’ve been quite obsessed with clear skin facts ever since. It’s so important to me and nutrition plays a HUGE roll in that. Great tips! I need to be better about washing my face as soon as I get home from the gym. My tip is to use apple cider vinegar as a toner. There’s nothing that stuff can’t do!